Two Italians come to town and the issue is always what and where are we eating. It’s no fun to take them only to Italian places so if they are close friends I take them to certain places that I particularly like and think they will enjoy. Once such place is Ed’s Lobster Bar. I like the somewhat spartan and white decor, the people shucking oysters at the side of the bar, the plain place mats but mostly I love the food. Lobster is my absolute favorite food. Oysters are a close second so Ed’s always works for me. Luckily my friends who arrived last week wanted to try something easy and eat seafood. 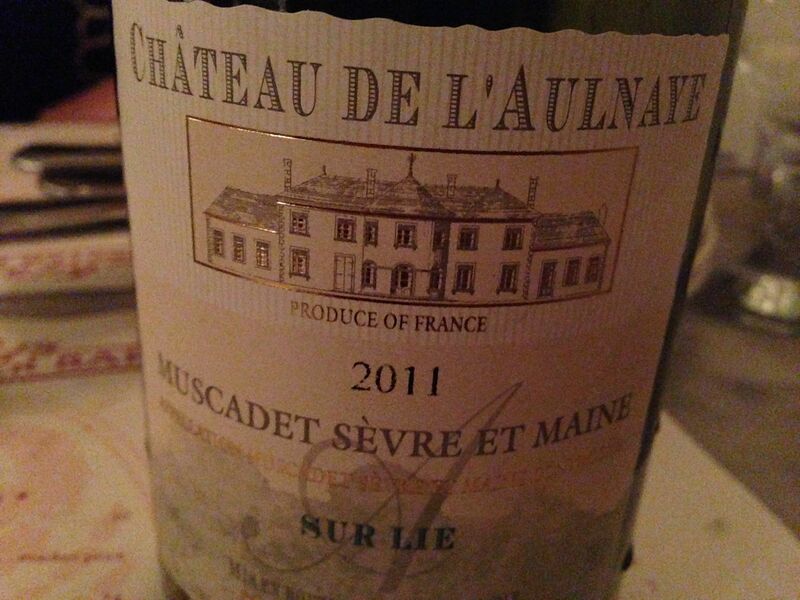 We shared a nice number of bottles of the perfect wine for oysters and lobster in my opinion, Muscadet Sèvre & Maine sur Lie from Chateau de l’Aulnaye 2011. The wine was exactly what it should be, light with stone fruit and floral notes, minerality and good acidity. The lees also add a slight toasty note which works with the sweetness that is inherent in lobster. The terroir at the Chateau is said to be unique because it is at the confluence of two rivers: the Sèvre Nantaise and the Maine. The grapes, 40-year old Melon de Bourgogne grapes, grow on gneiss soil. The wine is also nicely priced at around $15. Muscadet-Sevre-et-Maine is the top appellation among Muscadet vineyards in the Loire Valley, France. Completly agree, especially about the number of bottles shared ;-).